The new iLife suite is about to hit the streets, and with it comes an iPhoto update. This is good news for those of us who are both photo junkies and organization freaks. iPhoto is obviously the de facto solution for organizing your photos on a mac, but it’s not without it’s quirks (I’m looking at you, keywords). I’ve developed my own method for pseudo-tagging images in iPhoto that I believe to be a much simpler alternative to Apple’s wacky packed-in solution. It’s so simple, in fact, that it never occurred to me to write it up. Several people I’ve shown it to have actually found it quite useful, so I agreed to write this post. Then I forgot. Then they released a new iPhoto. Oops. 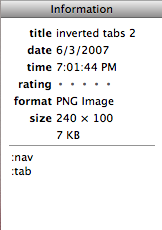 So, I give you, several years later than would have been helpful, Escapist’s Guide To Sane Tagging In iPhoto. 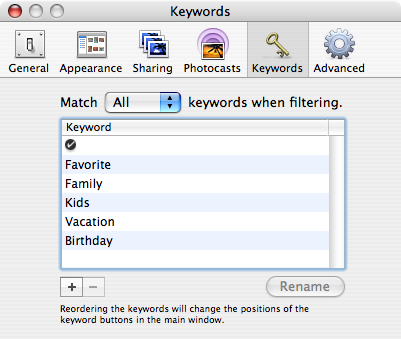 So far, iPhoto has featured a keyword scheme that could most kindly be described as… “unique”. To begin with, you need to predefine all of the keywords you plan to use across your entire library inside the iPhoto Preferences panel. This adds complexity to the simplest task associated with keywords: applying one to an image. The next oddity is that you need to open up a special Keywords pane in the main view in order to apply or query keywords. The ability to add and remove keywords from your search is very cool, but in my opinion, not worth all the tomfoolery. This truly is a new way of using keywords, but not really a suitable was of using tags. I guess they got the terminology right. Since iPhoto uses OS X’s standard search-as-you-type, it’s quick and easy to find anything in your library with a descriptive title and/or comments. Adding verbose comments to each image is probably not the best option, but you could certainly toss some quick and dirty, descriptive terms into that there comment field and treat them like tags! Right away you’ve just bought yourself the ability to work with tags without going into your preferences or pulling up the special keywords pane in the main view. This process should seem familiar to anyone used to working with tags online at sites like Flickr and YouTube. I prefix each of my pseudo-tags with a colon to help set them apart and to increase search accuracy. Searching for “:button” will only return items I’ve “tagged”, and not items that happen to have the string “button” in the title or description. Some of you programming nerds out there might recognize this as a fairly common way to be able to treat a string as a symbol without actually defining a variable. Turns out, that’s exactly what we’re doing. For my most common tags, I set up a handful of smart albums that self-populate with certain tags. For instance, my “Buttons” album has a rule that automatically grabs any images which have the string “:button” in their comments fields. It’s basically a saved query and gives the same result as typing “:button” into the search field. This way, though, I get a list of all my most common tags and one-click access to each. All of this, again, without any need to dive into the iPhoto Preferences or open the Keywords pane. So, that’s it. Now that you don’t need it, there it is. Now let’s all go download our iLife 08 updates and forget any of this ever happened.